In August 2011, my older brother Yassein—a businessman who is in no way politically involved—was praying inside the Mustafa Mosque in Daraya, southwest of Damascus, while a protest was happening outside. Security forces moved in to disperse the demonstration, arresting Yassein, who had not been participating. After his arrest, he was taken to the headquarters of Syrian Airforce Security. (Airforce Security is known for brutally torturing dissidents; it was responsible for the mutilation and killing of 13-year-old Hamza al-Khateeb at the outset of the uprising last year.) My brother has been held incommunicado ever since. That I have been spared Yassein’s fate—indeed, a fate perhaps even worse than his—is only because I left Syria years ago, after years of active political opposition. My current distance from my country has undoubtedly preserved my safety. But it has not at all changed my assessment of the Assad regime’s terrors: Instead, it has only made me more determined in my opposition to Assad’s rule, and more hopeful that its end is near. Indeed, I am confident that my difficult personal journey—from domestic political reformer to leader of a government-in-exile—will one day tell a tale of redemption. My political activity began in the early 2000s, when circumstances conspired to initiate a period of reform in Syria that has come to be known as the “Damascus Spring.” In his inauguration address on July 17, 2000, Bashar al-Assad emphasized the importance of respecting public opinion. Syrians’ understood this to mean that they had been granted some measure of freedom of expression—a freedom that intellectuals like myself were eager to use. In the subsequent months, Syrian civil society coalesced around a common cause: building a free, open society. But these hopes for a new dawn in Syrian political and intellectual life were dashed when Bashar began arresting the major players in the Damascus Spring in 2001 (including eight participants in the National Dialogue Forum). Of course, my efforts did not go unnoticed by the Assad regime. In typical fashion, the regime sought to terrorize me and my family. But, having experienced freedom, however briefly, I decided to resist the regime’s oppression. In the subsequent years, despite the worsening political climate, I served as editor-in-chief of a political magazine—though only until the government shut it down and imprisoned much of its staff. I went on, in 2005, to create the Damascus Center for Human Rights Studies, which I used to help document and publicize the regime’s many human rights violations. My goal throughout was to help whittle away at the wall of fear that kept the Syrian people from rising up in demand of their rights. But I eventually succumbed to this wall of fear. After receiving repeated threats, I felt compelled to leave my country in 2007. Being forced to emigrate in this manner was incredibly difficult and painful. I had to leave my home, my culture, my life’s work, and most importantly, my loved ones. But by clarifying the stakes, my exile helped to harden my resolve. It became clear to me that the Assad regime wasn’t just an agent of oppression against Syrian citizens, but an impediment to the very progress of history. I knew I was obliged to redouble my efforts against it. Of course, this commitment has come at a cost. Since 2008, my family, including my mother, brother, sisters, in-laws, nieces, and nephews, have all been banned from leaving Syria. Bashar has held my family hostage, as a way to put pressure on me. But I have remained a leader of the Syrian opposition, nonetheless. Of course, I have felt constant worry: It is unbelievably painful for me to watch, from exile, as my family is harassed due to my activities. Such fear is the currency that the Syrian regime forces its citizens to deal in. In that way, it is an act of resistance to refuse to submit to that fear—an act of resistance that, since emigrating, I have had the luxury and responsibility to perform. The embers of hope I have tried to keep alive over the past several years caught fire during the Arab Spring uprisings, and the monumental changes they brought to Tunisia and Egypt. Indeed, as soon as there were signs of revolution in Syria, I poured my energy into building a strong Syrian opposition. 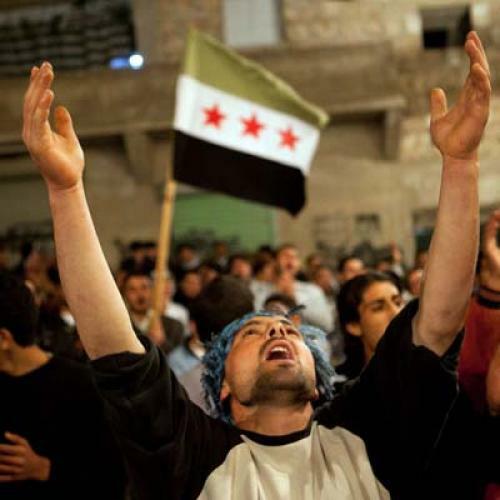 The Syrian National Council was formed in 2011 amid the Syrian revolution. Its formation was announced from Istanbul in August 2011, and although the council did not originally want to serve as a government in exile, it began to assume such a role as violence increased. During the Damascus Spring and thereafter, activists and intellectuals formed networks and continued to open the space for public critical debate. Many of the leaders of the Damascus Spring became pioneers of the SNC. The Syrian National Council has evolved tremendously since its founding and has formulated a sophisticated strategy to guide Syria through a post-Assad transition to democracy. Most significantly, the SNC has worked to overcome the imaginary sectarian divisions that the Assad regime has worked so carefully to inflame. The SNC leadership and general membership includes representatives of every political, religious, and ethnic group within Syrian society. Furthermore, it has emphasized transitional justice and respect for human rights, especially accounting for possible attempts to seek retribution against the Alawite community. While the SNC has been remarkable in its growth and improvement in such a short time and under such daunting conditions, the international community has not responded in kind. Assad has mounted a long, relentless, brutal campaign to restore the wall of fear, slaughtering civilians en masse by shelling neighborhoods like Bab Amr, and even carrying out mass executions. Yet the international community has stood by and done nothing. This is the great tragedy of the current situation: Now that the Syrian people have finally breached the fear barrier, we have been left entirely alone. Radwan Ziadeh is spokesperson for the Syrian National Council and a fellow at the Institute for Social Policy and Understanding in Washington.